Fiology thanks Joel of Financial 180 for shaping this lesson. 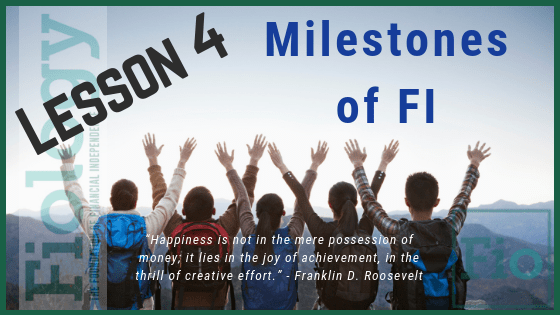 The Milestones of Financial Independence (FI) are checkpoints along our FI journey that represent significant accomplishments. They allow us to acknowledge our successes of the past and look forward to our next achievements. The Milestones of FI make it clear that FI itself isn’t a specific number in your bank account. In addition to getting closer to achieving Financial Independence, milestones represent growth, accomplishment, and maturity of perspective. The resources in this lesson describe three ways of establishing your own milestones. Joel’s is likely the most popular among the FI community as of this writing but there is value in exploring other frameworks. Take Action: After reading and listening to the resources above, select the achievement framework that resonates with you the most. Use the number that represents the amount of value you have chosen as your goal to reach FI, determined in How Much Money Do I Need To FI? and discover when you can expect to reach each milestone or checkpoint. You can sketch it out, graph it in excel, or type it in narrative form. Post it somewhere you will regularly see it as it will provide you motivation to reach the next milestone. Think of how you are going to celebrate achieving each milestone. Who will you share this experience with? Do you know someone, or have met someone since beginning this course, with which you can share your results?